Tag line: "The Lordi Motion Picture"
Finnish heavy metal band Lordi has been around since 1996, and from what I can gather by watching clips of the group's on-stage performances, their concerts feature a whole range of pyrotechnics. But that's not the only gimmick they fall back on. Along with the mini-explosions and flashing lights that illuminate their live shows, the members of Lordi also wear masks. Monster masks, to be more precise, and truth be told, these get-ups look pretty damn convincing. I mention all this because 2008's Dark Floors is also known as The Lordi Motion Picture, and stars the band as...you guessed it...monsters, hunting down some people who get lost in a hospital. All of this had me rolling my eyes as I'm sure some of you are rolling yours right now. I'm old enough to remember when Kiss, another rock group with a gimmick, came out with a 1978 made-for-TV movie titled Kiss Meets the Phantom of the Park, and even though I was a huge fan of their music (not to mention being only eight at the time), I knew that movie was crap. Well, hold onto your seats, because Dark Floors is not crap. In fact, I kinda liked it. Sarah (Skye Bennett) is an autistic young girl whose father, Ben (Noah Huntley), isn't happy with the level of care she's receiving at the local hospital. Despite the pleas of Sarah's doctor, Emily (Dominique McElligott), Ben checks his daughter out of the facility, intent on taking her home. But as the three climb into the elevator, they, along with a security guard (Leon Gerbert), a visitor (William Hope) and a slightly deranged man named Tobias (Ronald Pickup), are transported to an alternate reality, one that looks very much like the hospital except for the fact there are no other people around. The six join forces to try and make it to the ground floor, yet find their path blocked at every turn by a variety of ghosts, demons, and monsters, all determined to prevent them from leaving there alive. It isn’t long before the action in Dark Floors switches from the actual hospital to the alternate dimension one, and what seemed like a normal location moments earlier takes on a creepy feel with no patients, nurses, not even a single sound to keep the main characters company. That’s the first clue something very strange is going on; the second comes when the six stumble upon an old woman in a wheelchair, her eyes torn from their sockets. Dark Floors also makes great use of sound to signify when danger is approaching, sometimes muted and in the distance, other times loud and clear, and right on the other side of a closed door. Then, what’s only been hinted at finally takes form when a ghost woman (played by Lordi band member, Awa) suddenly materializes, shrieking so loudly that she breaks every window as she chases her intended victims down a hallway. The rest of Lordi are also on hand, utilizing their already impressive costumes for spectacular effect. That said, Dark Floors is a bit of a mess in the plot department, and any attempts to try and piece together what's happening on-screen will usually result in frustration. There are hints of a solution to the film's mysteries in Sarah's incoherent ramblings, and scenes featuring a series of time overlaps bring a slick nuance to the story, yet neither of these aspects are fully explored, and in the end, raise more questions than they answer. 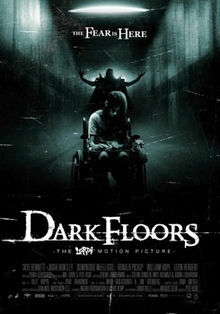 But with stunning CGI effects and a number of good scares, Dark Floors offers just enough of a diversion to take your mind off how ridiculous it truly is.